I first heard Frank Moore in a radio talkshow that Willem de Ridder did for Radio 100 in the early 90’s. (That was many years after I first heard Willem on the radio, in the Radiola Art Salon.) If I remember it correct, he told that Frank Moore was born 100% spastic and therefore had to live tied to his wheelchair, 24 hours a day. He could not talk and only at a relative late age it became clear to others that in this invalid body housed a fully healthy mind. And not only a healthy mind, but a happy mind too. Frank Moore, as Willem told his audience, is now an artist, and unlike most other people, he feels totally free. His thoughts are not polluted by education or other ideas that society imposes on so called normal people. I was flabbergasted by the recording of Frank Moore. This was both one of the best jokes I had heard in ages, and it was a extremely strong statement about handicaps and society. The whole idea that there is something wrong with people who have physical or mental limitations, seems totally ridiculous to me. But, being a non-handicapped person, I find it difficult to say what I think about handicaps; I think it is much better when people like Frank Moore do it. Of course I wanted to have a copy of that tape. After I was able to think straight again, I had turned on my tape recorder, but I missed the first half minute of the song (??Ruby??). I don’t have a want list, but I remember many things that I heard or read somewhere. And usually there comes a day when these things show up, often when I least expect them. Ten years later I found a copy of the tape in my mail box, send to me by Ed Veenstra. 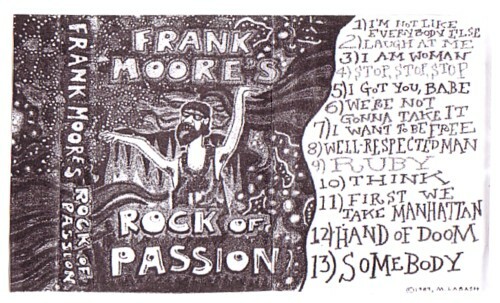 It turned out to be 13 songs, or something like songs, that Frank Moore had recorded in 1987. Some songs have lyrics that get extra meaning in this context: I’m not like everybody else , Laugh at me , I want to be free . But I like the duet with his girlfriend best.